Incarnated Angels tend to – have sweet, heart shaped faces; have overeating and weight issues; be a fixed astrological sign (Leo, Taurus, Sagittarius, Scorpio and Aquarius); be professional helpers (teachers, healers, customer service); lighten or highlight their hair; have difficulty saying no; love angel objects; have extra guardian angels; seem to glow; fall in love with someone’s potential and tend to coax their greatness; have co-dependent relationships with addicts; have voluptuous bodies; have mellow personalities; stay in relationships much longer than they should; and obey rules. Incarnated Elementals/Nature Spirits tend to – disobey rules; have mischief in their eyes; have slim bodies or fast metabolisms; have sensitive nervous systems; be addicts; love to party; prefer the company of animals over people; be warriors for the Earth; love nature; have comedic, musical or artistic skills; be noncommittal or immature; have Celtic origins; play practical jokes; fiercely independent; have finances that are feast or famine; and have powerful energy to manifest things they desire. Star People tend to – be socially awkward; believe in UFO’s or ET’s; be compulsively thoughtful without need for appreciation; conduct Reiki or other energy healing; follow their life’s mission which may be more important than getting married or having kids; and don’t feel Earth is their home. Wise Ones tend to – get along well with most people; have magical abilities; have past life memories of Arthurian or Atlantean times; believe that they were persecuted for their beliefs in a past life; study tarot or astrology; and be drawn to earth-based spirituality like shamanism or full-moon ceremonies. 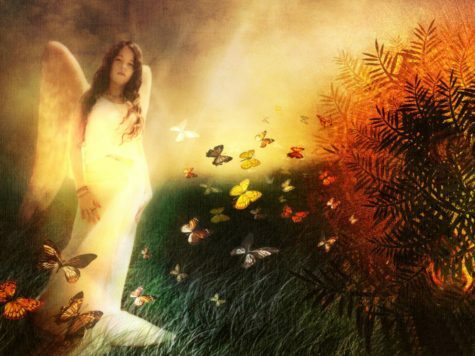 Saint Germain is a loving, benevolent ascended master who wishes to work with lightworkers – that is, people who want to help the world clean up its act. He provides guidance, protection, and courage. He often works in conjunction with the Archangel Michael. People don’t call Saint Germain, he’s the one who calls first. He seems to just show up wherever light workers are gathered in classes, study groups, or prayer meetings. He works with spiritual teachers to encourage their outgoing nature and leadership skills. That’s not to say, however, that you can’t request a special audience with him when you desire a message or some type of motivation. Simply think, Saint Germain, I need your help. Wait a moment, and then mentally let him know the situation or question with which you need assistance. You’ll know that he’s with you because a creative answer will come to you suddenly. You may also see violet-purple sparkles of light in the room. Or, you may start seeing violet-purple everywhere you go, on people’s clothing or on flowers, for instance. You’ll also begin thinking or writing profound thoughts on how to help others. His real full name is Comte de Saint Germain, or The Count of Saint Germain. He was a man born of royal blood somewhere between 1690 and 1710, although reports conflict as to his parents’ lineage. Some say that his mother was Marie de Neubourg, the widow of King Charles II of Spain, and that his father was Comte Adanero. Others (particularly those associated with Theosophy) hold that his father was Prince Ragoczy of Transylvania. A few reports say that he was Prince Ragoczy. Still others claim he’s a Portuguese Jew. It is believed by some that Sir Francis Bacon faked his own death on Easter Sunday, 9 April 1626, attended his own funeral and made his way from England to Transylvania where he found lodging in a castle owned by the Rakóczi family. There, on 1 May 1684, Bacon, by using alchemy, became an immortal occult master and adopted the name Saint Germain and became one of the Masters of the Ancient Wisdom, a group of beings that, Theosophists believe, form a Spiritual Hierarchy of planet Earth sometimes called the Ascended Masters. Thus, according to these beliefs, Saint Germain was a mysterious manifestation of the “resurrected form” (or “resurrection body”) of Sir Francis Bacon. Some write that his name Saint Germain was invented by him as a French version of the Latin Sanctus Germanus, meaning “Holy Brother”. In the Ascended Master Teachings (but not in traditional Theosophy), the Master R, or the Master Rakóczi, also known as the Great Divine Director (a term introduced by Guy Ballard in the 1930s) is a separate and distinct being from Saint Germain – the Master Rakoczi is regarded in the Ascended Master Teachings as a name used by the Great Divine Director when he was functioning as Saint Germain’s teacher in the Great White Brotherhood of Ascended Masters. Saint Germain, as one of the Masters of the Ancient Wisdom, is credited with near god-like powers and with longevity. Many groups honor Saint Germain as a supernatural being called a Master of the Ancient Wisdom or an Ascended master. In the Ascended Master Teachings he is referred to simply as Saint Germain, or as the Ascended Master Saint Germain. 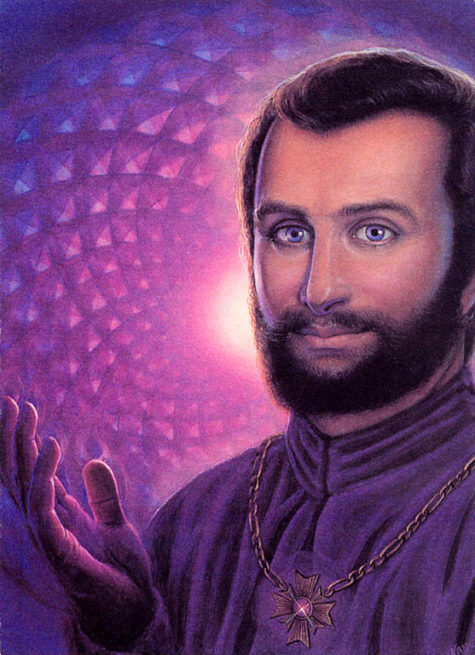 As an Ascended Master, Saint Germain is believed to have many magical powers such as the ability to teleport, levitate, walk through walls, and to inspire people by telepathy, among others. Theosophists consider him to be a Mahatma, Masters of the Ancient Wisdom or Adept. Helena Blavatsky said that he was one of her Masters of Wisdom and hinted that he had given her secret documents. Some esoteric groups credit him with inspiring the Founding Fathers to draft the United States Declaration of Independence and the Constitution, as well as providing the design of the Great Seal of the United States.